Recently, I was lucky enough to join my family for a seaside trip to South Carolina. After months of talking about the sandy beaches and salty ocean, my preschool-aged niece was excited to finally experience everything she had heard about with her own five senses! No matter how often we described the feeling of sand between our toes or the weightlessness of riding the waves in the Atlantic, it was difficult for her to make connections without actually experiencing it herself. All week, I could see these new experiences providing her with rich language, early science concepts, and filling her brain with background knowledge she will carry with her for years to come. Sand can be an easy addition to any sensory table! You can find play sand in most toy or home improvement stores. Kinetic sand on table top trays can be a great alternative for classrooms without a sensory table. Add a variety of tools & buckets from a local dollar store, and even some water to experiment with. The children can create and build just like they are at the beach! Know any friends or family heading to the beach? Ask them to bring back a bag full of shells! Adding real shells to your math or science learning area with some magnifying glasses and scales opens up an opportunity to explore math concepts and increase observation skills. Also, using descriptive words to talk about shell textures can help build rich language. Set up some experimentation of salt water vs. fresh water. Children can do a little taste-testing, and play with the idea of “What sinks and what floats?” using different materials in the classroom. I love this salt water experiment. When we bring in authentic materials, it helps children connect concepts and understand our learning themes in a tangible and meaningful way! This entry was posted in Best Practice, Infants and Toddlers, learning through play, Preschool and tagged science, sensory activities, STEAM, STEM on September 8, 2017 by Jenn Malicoat. Work fine motor muscles. Working with different types of tools/media they can build the hand muscles for better dexterity. This lays the foundation for cutting and writing. Examples of this could be setting out a hole punch and pieces of paper, using scissors to cut straws or clay. Enhance critical thinking skills. When a child is in the creative process, his/her mind is thinking out ways to make/create the subject at hand. 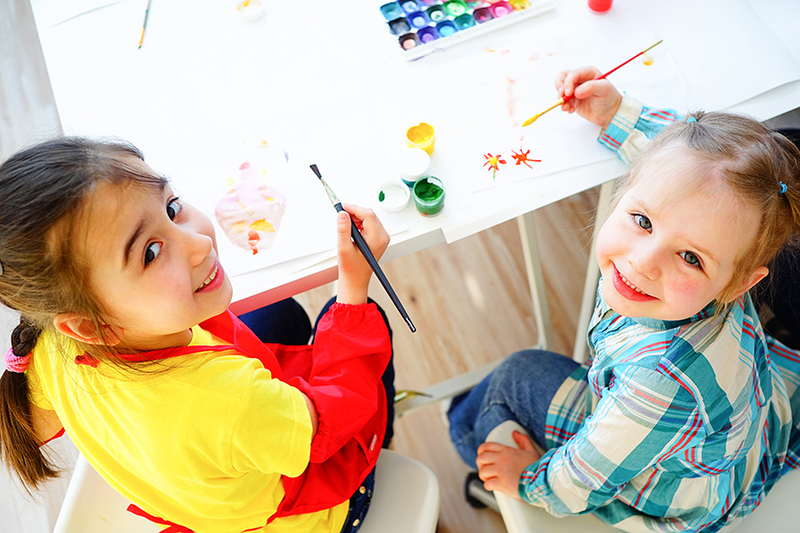 Gathering information and hypothesizing how to create the artwork builds the mind for thinking out other scenarios children may face throughout everyday events. Instead of laying out specific supplies for the children to all come to the same end result, give lots of options: hole punches, stamps, stickers, beads, string, tongue depressors, pom poms, glue, scissors—the possibilities are endless! Express themselves. If you provide the materials, they will come! Allowing the child to experiment will result in something that has meaning for them. 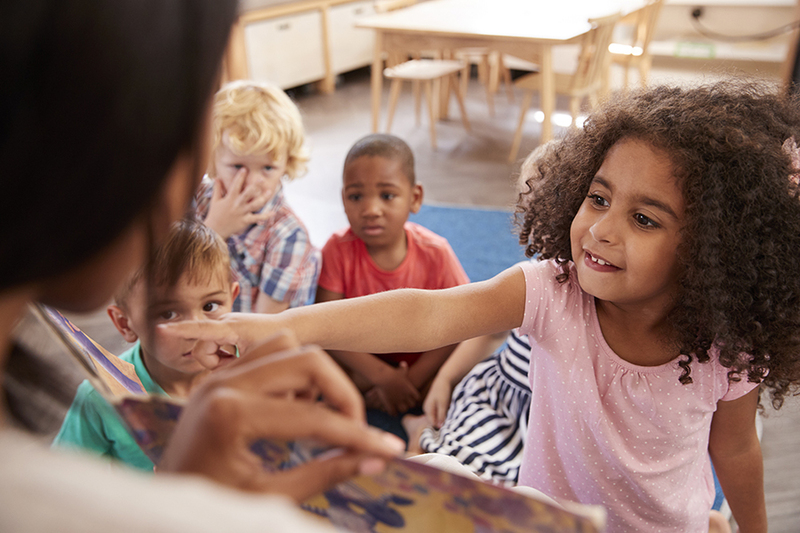 Sitting and asking questions about the creative process also helps the child develop the language and vocabulary for something that they may have never been able to talk about before. For example, something you may ask would be, “Why did you choose the felt to make the dog’s ears?” or “How can you attach the ears to the paper?” You can also help them express what they created by writing about it. This gives the families the story and process behind the masterpiece. Art in an early childhood program is about more than just making something cute; it is creating the moments for a child to discover and learn. I said it before and I will say it again: let children have the time to play and try new things. After all, learning through play is how a child learns best! This entry was posted in Best Practice, Early Childhood, Infants and Toddlers, Preschool and tagged children's art, learning through play, process art on July 20, 2017 by Bridget Jackson. School Is Out…What Do We Do Now? Summer is here and if you are like me, a routine master, you are in a panic. School is over and children are shouting, “I am BORED!” You realize that the time you had celebrating the end of a successful school year must come to an end as you begin planning a summer program. Unfortunately, that time has slipped away and you are scrambling to find ideas, theme/unit items, guest speakers and field trip forms. PAUSE. Teacher life does not have to be chaotic and always busy with grandiose activities. Plan activities that you would like to enjoy with your children and SLOW DOWN. On our first day of the summer program when I was still teaching, I gathered my class of preschoolers on our group time rug. We sat and talked about what they wanted to do to have fun in our summer before they started ‘big kid school’ in the fall. It may not seem like a big thing to do, however, making it a priority to sit down and include children in the planning is the best thing you can do to make your summer awesome! Here are three simple tips to help you and your planners come up with safe, age-appropriate ideas. Give real expectations and choices. Kids might come up with about 9,000 ways to blow your supply budget and your stress limit. Setting limits and goals are okay, talk it out! Help children to work through the critical thinking and reasoning process. Make a map. Sometimes the best plans for your students can be better examined with charting! Written lists can also help them express their opinions and interests in a concrete way. You can make one list of plans the staff members want to do, one list of things children want to do, and compare the lists that both the staff and the children can do together. Research and choose. Pinterest makes visual organization a breeze. Also, going to the library to look at books together to get ideas is wonderful. You can take the more hands-on approach and make a collage of activities on poster paper using magazines and other paper material. Let your children help you look for ideas on the list. Whatever the activity— creating art, outdoor activity, cooking lesson—it is right there for our children who are still learning. It gives them a chance to make connections. After all of your hard work with your ‘assistants,’ your summer will be something that you and your children have always wanted. No stress involved (or very little). If I have learned anything from teaching, this one thing is true: the fun plans you have intended for the children to do are not always as good as the children’s ideas of fun. Let them take the lead—within reason. Find out what makes things fun for your children and watch the laughter, smiles and precious moments appear. Collect those teachable moments, not the material things, and everyone will have a very happy summer. This entry was posted in learning through play, Preschool, School Age, teachers and tagged summer, summer learning on June 20, 2017 by Bridget Jackson.